Limited edition Overmolded BrickArms weapons. They are all very limited, very difficult to make, and very, very cool. BrickArms founder Will Chapman uses a specially developed two-step process to make premium quality minifig weapons from two different colors of plastic. These hand-made weapons are the pinnacle of the custom plastic injection artform and are made in very limited quantities. All come packed in a special BrickArms “Reloaded” blister pack. BrickArms "Protos" are all hand-made in the BrickArms workshop using a single-shot injection molding machine, using molds designed and created by BrickArms founder Will Chapman. These are unique items and are different from the regular production BrickArms that are factory made. A great addition for several different models, the BrickArms 76mm Cannon Barrel was a common gun used during World War II. This gun was seen on iconic American armored vehicles such as the Easy Eight Sherman and M18 Hellcat. A great addition for several different models, the BrickArms 57mm Cannon Barrel was a common gun used in both world wars. Also known as the British “six pounder”, this gun deployed with many different tanks and antitank guns. Used to reduce recoil and increase accuracy, a muzzle brake redirects propellant gasses produced when the shell is fired. The BrickArms Easy Eight Muzzle Brake will make an excellent addition to your M4A3E8 Easy Eight Sherman! Used to reduce recoil and increase accuracy, a muzzle brake redirects propellant gasses produced when the shell is fired. The BrickArms Easy Panther Muzzle Brake will make an excellent addition to your Panther tank! Used to reduce recoil and increase accuracy, a muzzle brake redirects propellant gasses produced when the shell is fired. The BrickArms Firefly Muzzle Brake will make an excellent addition to your Sherman Firefly! Designed to fit into a Mixel LEGO ball mount joint, this barrel can be easily attached to existing kits. This gun was commonly seen on several tanks including the M3/M5 Stuart, M3 Lee, T-34, or M4 Sherman. Designed to fit into a Mixel LEGO ball mount joint, this barrel can be easily attached to existing kits. This gun was commonly seen on several American tanks including the M4 Sherman, M26 Pershing, and M46 Patton. BrickArms Centurion Raider Rifle with Blade Attachment, minifigure not included! The hand-injected, prototype BrickArms M27 IAR, standard issue for modern U.S. Marines. The hand-injected, prototype BrickArms Lebel Rifle is here! This French gun is ready for your French minifigures. The BrickArms Lebel Rifle (Proto) is here! This French gun is ready for your French minifigures. 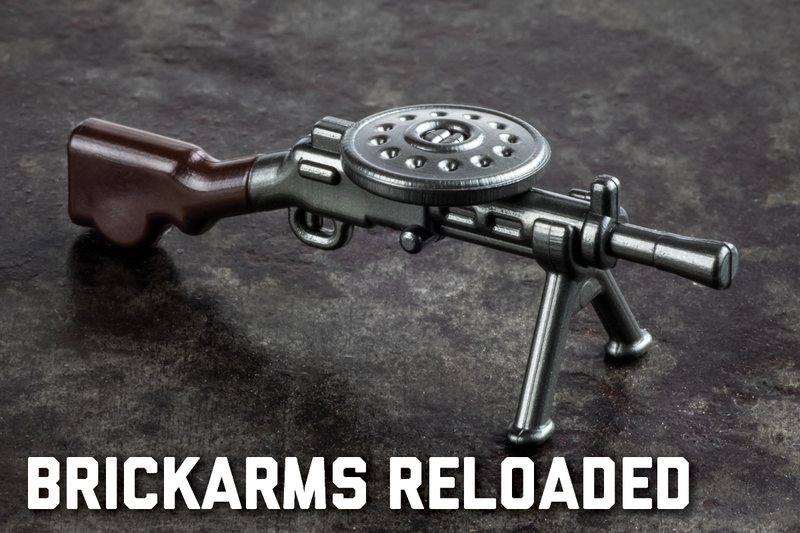 Get the BrickArms M1895 Lever Action Rifle Russian Overmolded now! Get this BrickArms Reloaded Trench Mace now! Designed by Will Chapman by hand; it will sell quickly! Attaches to minifigs with included LEGO neck bracket, but can also be mounted to any BrickArms LCV or PCV Vest.